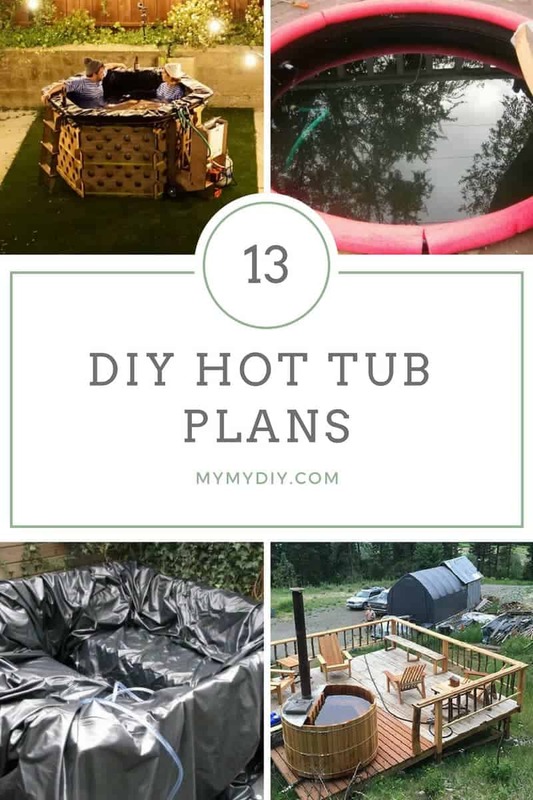 If you’d like to learn how to build your own hot tub- we’ve compiled a list of 13 DIY hot tub plans. These woodworking plans are somewhat involved- probably best for intermediate to advanced builders. But they can be constructed a lot cheaper than purchasing a ready-made option. There are some fun and innovative designs on this list- #2 is a cheap metal tub design heated by firewood, #5 is a portable plan; and #12 is a gorgeous cedar design that complements an outdoor deck. Scroll through our list and click the ‘View Plans’ button to access the free plan instructions. Bored while on your camping trip? 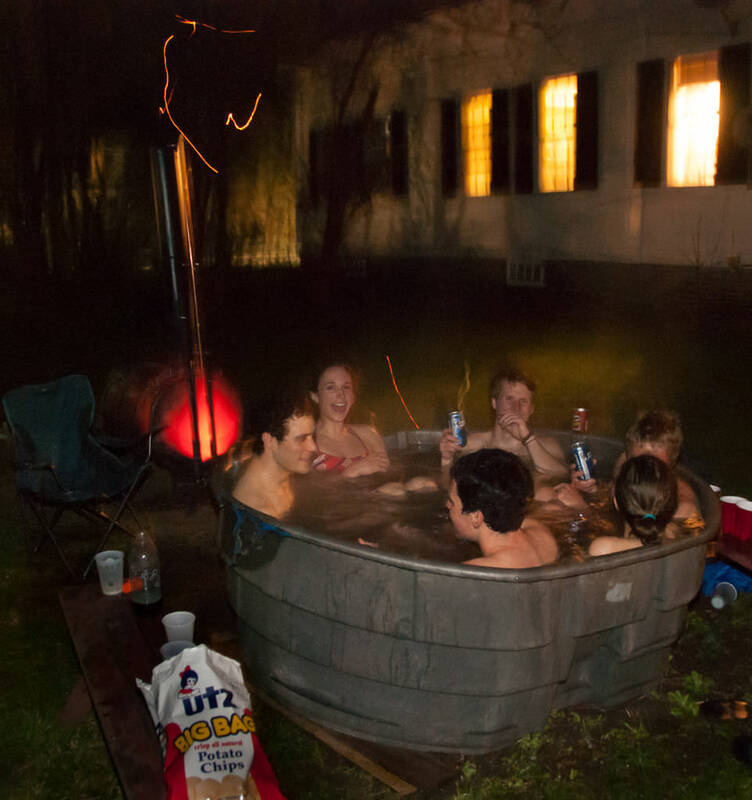 This creative DIY plan gives you a way to build a makeshift hot tub in the great outdoors. You’ll need a chainsaw, car generator, shovel, tarp, pump, hose, and a few other things. The idea here is to pick a good spot by a lake or body of water and dig a wide and deep hole. Place logs around the perimeter to make a frame and line the inside with tarp. Then, connect a pump in the water to the generator of your car or power inverter to heat it up. You’ll also need to heat up some rocks on a smaller fire to help generate heat. This is a great idea for a party or small gathering. The tub can fit around six to eight people and only cost $650 to make. It does take a little to get up to temperature, though – around three hours. You’ll need materials like a 55-gallon steel barrel, copper pipe, water pump, pipe fitting, hacksaw, propane torch, and fire bricks. First, build a stove out of your barrel. Then coil the tubing to make a heat exchanger and place it on the stove, connect the heater to the tub, fire it up, and hop in once it is hot enough. You can easily and quickly set this up in any backyard. If you want to enjoy a soak in a hot tub but don’t want to spend thousands of dollars, this is the perfect DIY project for you. This tub is made using a very large steel garbage bin, inflatable kiddy pool, heating pipes, tubing, bilge pump, and a car battery. To start building this, make a heat exchanger inside of the metal garbage bin. You’ll need to drill a hole through the bin to weave the copper tubing in and around it. Make sure you coil it around the outside super tightly. Simply connect to this to the pool, add water (lots of it) and light your fire to heat things up. This is the perfect DIY project for you if you don’t want to wait hours for the water to get hot and up to temperature. First, build the fire cage, make a tub (this builder used a large wire cage and lined it with heavy plastic), then connect a pond pump with rubber hoses and connect both of these to a radiator. Once everything is assembled, light the fire and you should be ready to hop in for a soak in less than an hour. Although made in the builder’s backyard, this could be made or transported anywhere and enjoyed with friends – after a few drinks and some s’mores, the water would be warm enough for you to hop in. 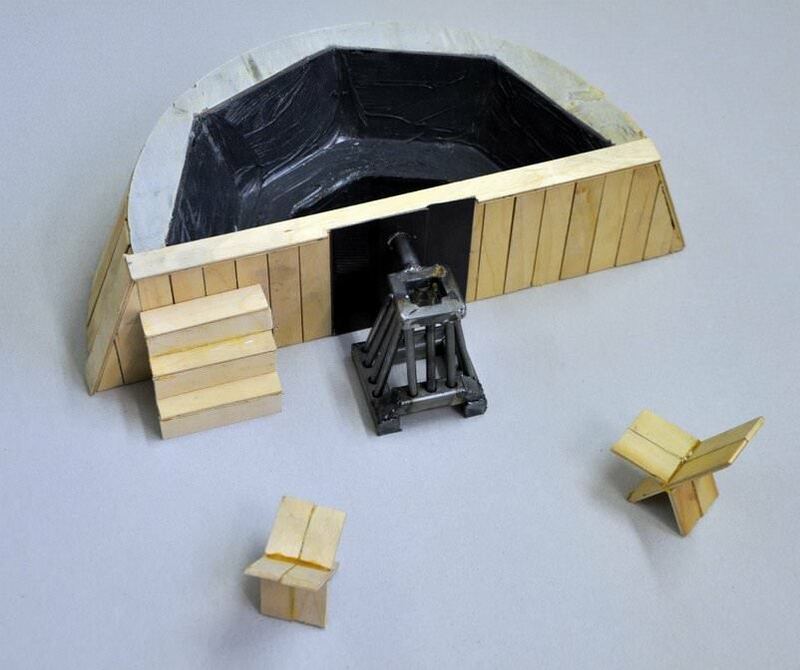 This is an incredibly professional and thought-out DIY idea – the builder made a 3D design online and even a scale model before building the actual tub. To make this yourself, you will need a water pump, water heater, water filter, vinyl liner, plywood, ratchet straps, and a battery. First, cut the wood and pack all of your supplies in your car. Once at your destination, make a frame out of the plywood and add some foil for insulation. Then attach the propane hose to the water tank and connect the filter. This builder even went a step further and added some IKEA stools inside the tub for seating. 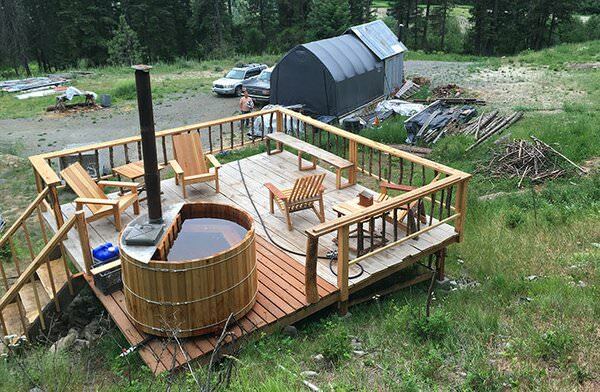 This hot tub is an extremely rustic DIY project – the frame is made out of fallen logs and discarded railroad ties and the whole project cost around $250 to make. Materials required for this included braided vinyl, twine, copper couplings, a submersible fountain pump, hose clamps, and a blowtorch. The heating component is powered by copper tubing that you’ll need to coil up yourself. The builder suggests getting someone at your local home improvement store to help you solder the copper together if you’re inexperienced. 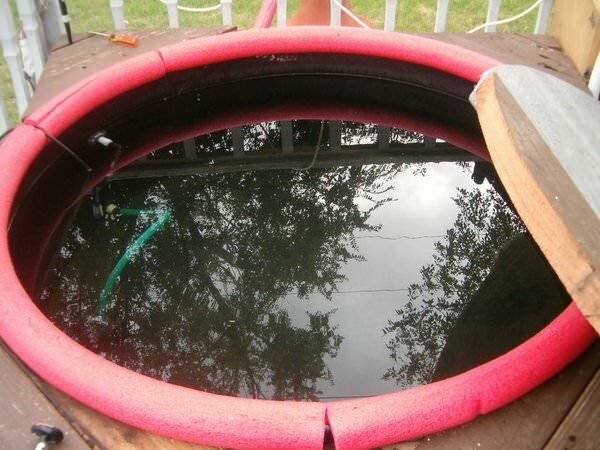 Once you have the base, place a tarp in the opening and fill it with water. Once the tub is filled, you can light the fire and wait for things to heat up. 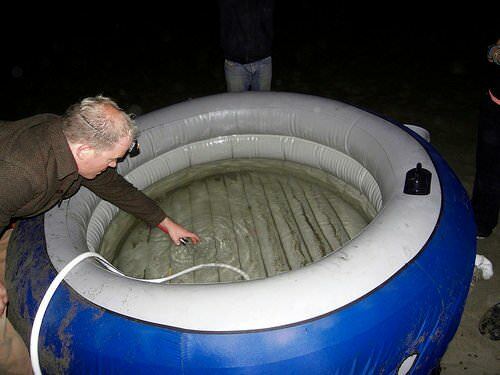 This DIY idea essentially takes an inflatable pool and uses a heat exchanger to filter and warm the water. Easily portable, you take this camping or to the lake and fill it with salt water, build a bonfire, and then set everything up. The heat exchanger is a coil of copper tubing that needs to be mounted to a frame – an old end table will work just fine. Before you travel to your location, make sure you have a small generator and various pumps and hoses – this builder didn’t bring long enough hoses and had to shovel buckets of water back and forth to fill the tub. 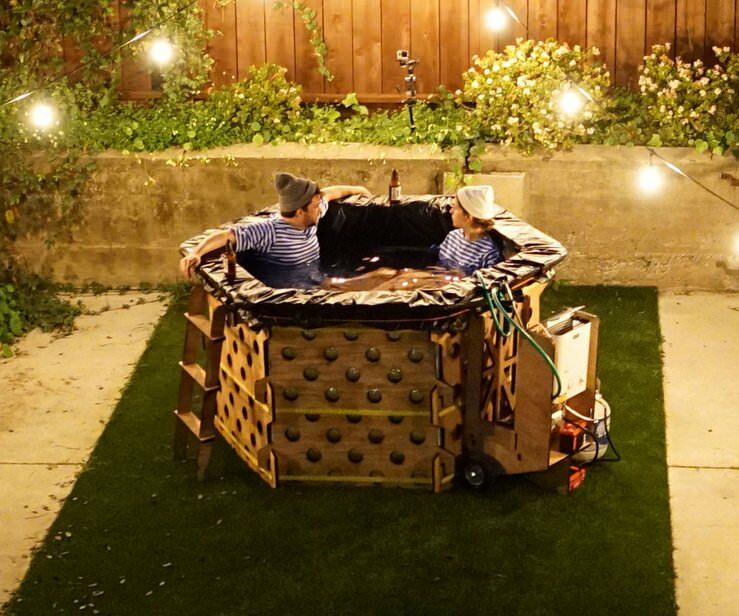 If you’re really looking to get creative, try following this DIY project – the builder found a way to turn old couches into a hot tub. Simply pick the perfect spot and place two sofas so they’re facing one another. Using MFC, you’ll need to make a box around the sofas using glue or nails. Then, use some polyurethane foam to fill in any big gaps and give support for the rubber sheet or tarp – you don’t want water leaking anywhere. The builder then used some rubber garden pond sheeting and laid it over everything. To keep things simple, just connect this to your hot water from your tap. Another inexpensive and relatively easy DIY project, you’ll need things like a stock tank, outdoor fireplace, channel-lock pliers, copper tubing, PVC adapters, hose clamps, jig saw, electrical tape, and a fountain pump to make this. After cleaning and preparing the tank, install the spigots and faucets, set up the fireplace, attach the hose and the pump, and start heating things up. If you’re going to be using this long-term, it would also be a good idea to make a cover for the tub. This designer traced the outline of the pool over some plywood and then cut it to fit. 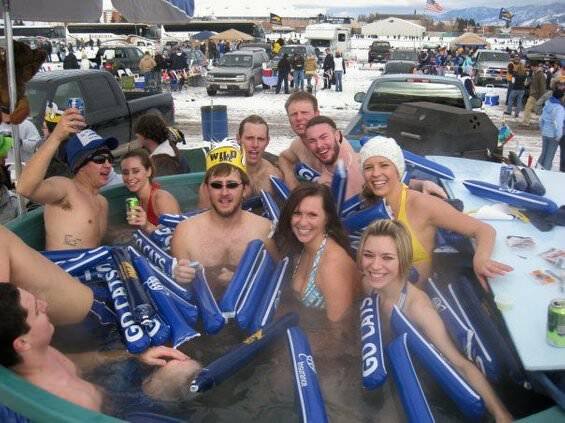 If you love tailgating at your local football games, follow this DIY idea next time and bring your own hot tub! You’ll need quite a few things, like a cattle stock tank, trailer, thick foam boards, water pumps, and a heat exchanger. This DIYer also made good use out of a discarded grill, using the copper tubing to circulate the heat. This was done in Montana, so the tub took around 24 hours to get up to temperature. However, it would probably take less time in a warmer environment and if properly insulated the tub will stay hot without a problem – this builder insulated the pipes and bottom of the tub as well. If you’re extremely resourceful, you could make this tub for around just $75. You’ll need some stainless steel tubes, a power drill, big storage tank, foam mattress, paint stripper, scrap iron and metal, and an old LPG gas bottle. If you mark off where the lip of the cage is, you can use it as a top once you cut it off. You can use pretty much anything to insulate the tub, just make sure that you’re getting into every little nook and cranny with the foam. Then bend the heating coil, cut a keyhole in the tank to connect it with the heat exchange coils. Set a fire in the heater and you’re ready for a dip. 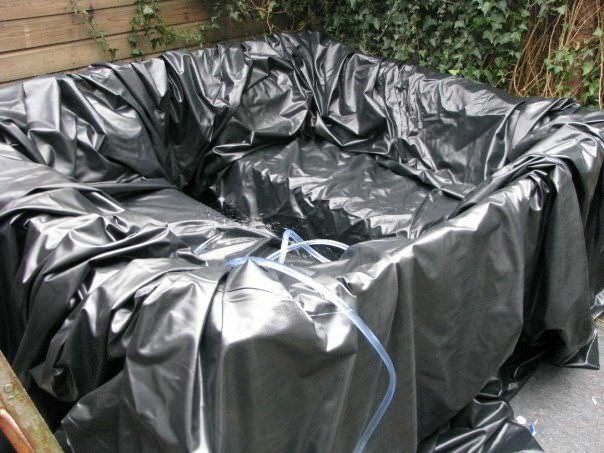 This is the perfect DIY plan for someone who wants an inexpensive and simple hot tub but still wants it to look nice and not be an eyesore. The builder was very picky when shopping around for the wood, making sure to only get pieces without any knots or blemishes. After you cut and join the staves, build the base and begin assembling the tub. Add benches inside is a great way to make things more comfortable and make this seem professional. 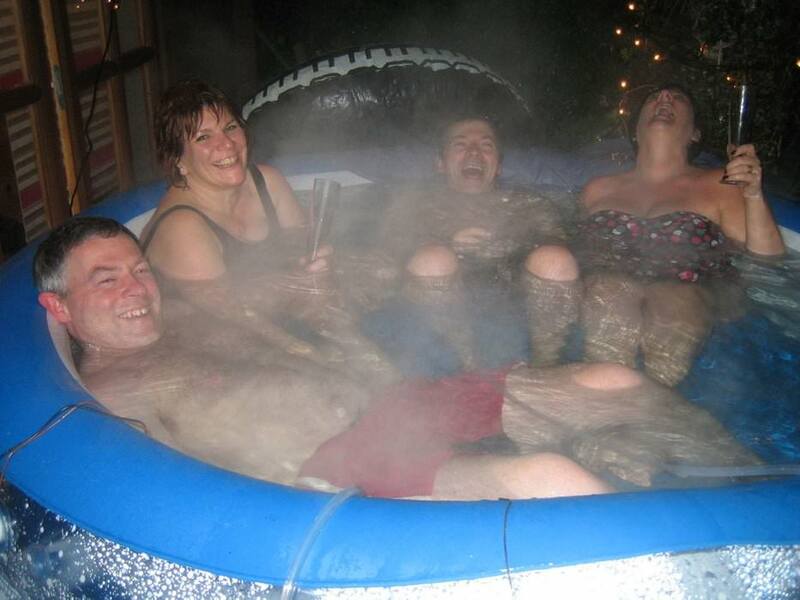 For their heat source, these designers bought a used hot tub stove that was completely submersible. The water inside should get hot pretty quickly and you can adjust the dimensions to fit any number of people. 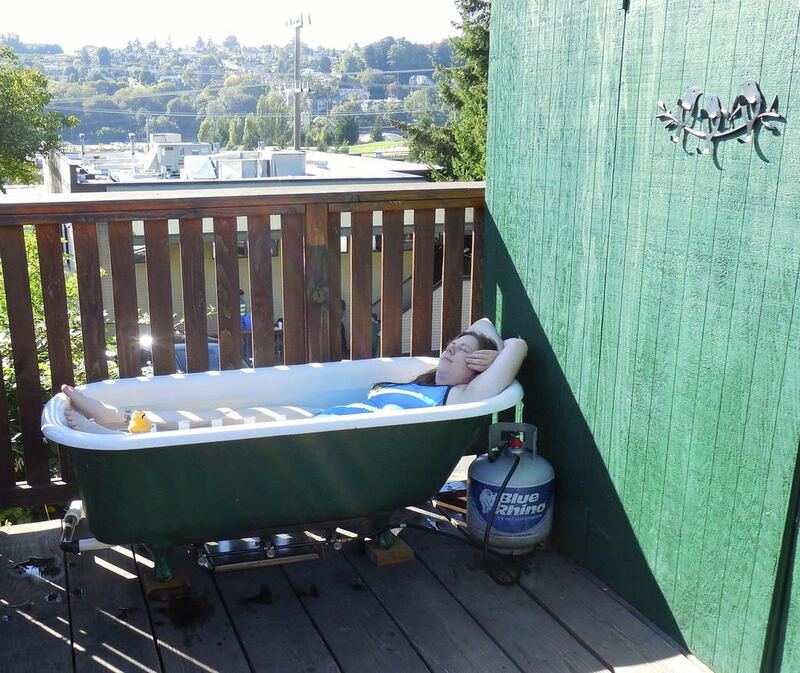 These resourceful DIYers found an old tub for sale on Craigslist and bought it for $100. To spice things up, they also painted the bottom a vibrant green color. The propane burner and regulator hose were also around $100 and can easily be bought on Amazon. After filling the tub, simply turn on the burners and turn them off about five to ten minutes before you’re ready to get in – the water will be scorching otherwise. The builder also suggests leaving one of the front burners on low while in the tub to keep the water nice and warm. Although this only fits one, it’s a great way to relax in the backyard or deck. 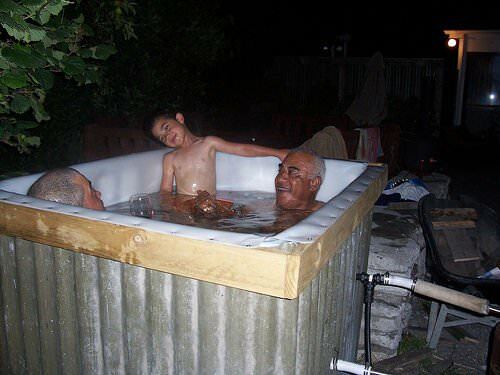 Over in Reddit, one user submitted his own do-it-yourself ultimate homemade hot tub spa – he claims it was made 100% from scratch. It did take him 6 months, he says. Other posters were incredibly impressed, saying that it is insane. Within the comment thread, he says that he used electrical box heater that use 110 volts and that generally he keeps the water at 104 degrees Fahrenheit. The heater itself cost $50 – it’s a bucket heater that he sealed with silicone and pipe wrap. Another user says that he made the mistake of purchasing a propane-fired instant hot water heater – he prefers a bucket heater now that he’s got it finished. The original poster responded saying that he invested in a 600 gallon per hour pump so that he could have 24 hours circulation. another commenter said when he built his tub he didn’t include water jets and primarily use a sump pump for the heater as well as a fine filter in addition to an above-ground pump and filter system that usually inflatable pools employ. Another commenter was stunned that it cost $2,000, wondering whether this would actually save money over just purchasing a retail option that could fit 6 people. The original poster said that while I did take a lot of time and effort, it would probably cost at least $15,000 to purchase a premade option. Indeed, there are a variety of places that you can go to purchase one including Costco, Coleman, Spa Depot + local shops that can also provide repair services, which can be important when it comes to maintaining them. Examining the Imgur album that he posted, he clarified some of the initial goals that he had when it came to constructing it. He said he was looking for something that was extra large and spacious. Something that would save him some money, as opposed to purchasing a pre-constructed or portable option, he was also looking for something that would be efficient and well insulated so that operating costs wouldn’t be too high. And finally, he was looking to build something from the pdf plan that would be higher quality than a lot of the options currently on the market. The Imgur album kicks off with some sketches he made – they described using three-quarter inch thick and 24 in wide plywood shelving to create the seats and footwell pieces. Over in the Reddit woodworking forum, one user was wondering whether Cedar was necessary to use. He describes wanting to build a small wooden hot tub that could live outdoors – he wanted it to be shaped like a rectangle and not something barrel-shaped and circular. He was looking for a pdf plan, specifically. One of the top responses came from a Redditor who said that cedar is often preferred because it neutralizes communicable diseases from the amount of women you’ll enjoy in the hot tub – this was actually a joke, but it is the most up-voted comment on the post. A more serious response came from a user who says that cedar is often preferred for outdoor woodworking projects because it handles being wet extremely well – while a lot of other Woods don’t. He says that wild Teak is another option, it is a lot more expensive than Cedar. His recommendation was to ensure that the frames are strong because once you fill it up with water is going to put a lot of pressure pushing on the sides. Another poster commented that he works a lot with decking Woods Hive and he says that people use white oak wood to make barrels, so that is another type of wood that could work if you’re building one of these. Over in the DIWhy subreddit a user submitted a comical PDF instruction plan for a living room hot tub project. Inside the Imgur post, the image gallery displays how this enterprising craftsperson constructed an indoor hot tub that sits inside a living room in front of the fireplace. 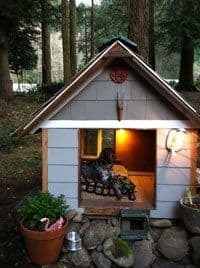 While a lot of Redditors thought this was a really cool project, others thought it was a foolhardy idea that may compromise the structural integrity of the home and also make resale difficult. Other users said that it is a stupid idea but very well executed – apparently, the woodworker used expert Craftsman to help him do a lot of the work, so the project might not be as foolhardy as it might seem on the surface. The last option we looked at was a Wood-Fired hot tub project – it’s particularly attractive and the trick here is that the tub portion is made out of plastic and surrounded by an arc of wood. He also included some fun pictures of his family celebrating Christmas in the tub – there are over 10 people inside of it all enjoying the party heated by the wood fire. Over in the comments section one Pool & Spa service technician suggested that if you’re going to try to build one of these but her having trouble with the copper heat exchange method, you can always resort to Craigslist to purchase cheap, old pool heaters that don’t have any leaks. The original poster explains that he decided to build it because he wanted to create a wedding present for his sister. He employed copper coils and a 250-gallon cattle drinker that he purchased from the auction site eBay for under $200. He says that to his mind it should have taken a week to build but he was in a relationship with a high-maintenance girlfriend so the entire thing took him a couple of months. Another poster wondered what types of fittings he used between the tank and the pipes. The poster responded that he employed a water tank fitting that was able to seal on to the tank and uses compression fittings for the copper pipes. The rest of the different fittings were soldered.